As we’ve written, and tweeted, and Facebooked, and pinned a million times, StickerYou's custom stickers can be great for small businesses looking for an easy, fast and affordable method to label and market their products. Every once in a while we like to check up on business owners to see how they like their labels and how they look. Jennifer Early of Pure Possibility Handmade Crafts had this to say about her labels. I started my business in July 2013. I focus on making products that are not only more eco-friendly but fun. I started a line called Creative Collaborations almost immediately. The line features original art done by Samantha Nowak Illustrations and the custom fragrances I've blended to match the art. One of my bigger challenges in getting this line out was to find a way to make labels that was fast, easy, and of course...cost effective for a small startup business. After printing labels on my own for my first round of products I decided I needed something more professional. Hours and hours of web browsing later I found StickerYou. The website alone is intuitive and easy to use for a novice at such things. When I had questions Brad was easily available through instant messaging. He has been integral in helping me get things rolling. My first order of stickers has been used to label products that are now in Kansas stores. One thing to add here - the stickers are re-positional which DEFINITELY makes my work soooo much easier and means I don't waste anything by tearing it when I have to move something. 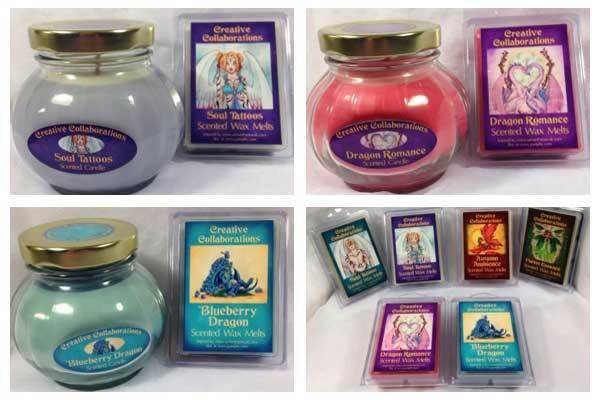 In mid March 2014 my product base will expand from candles and wax melts to include lotions and roll on fragrance which will be at a booth in Kansas at Planet Comic Con. The stickers I am using as labels are so clean and professional in presentation that I am confident they will be boosting sales and exposure for my business at this event! I really could go on and on at how pleased I am with StickerYou! To wrap it up though, Sam at Samantha Nowak Illustrations also complimented the professional look of the stickers. Today I visited a local shop to see about getting products placed there. The owner was very interested and I now have a potential wholesale opportunity and I know that without the crowning jewels of these labels from StickerYou it may not have been possible. Thanks Jennifer for sharing your story with us, we are delighted you love your customized stickers. Check out Jennifer’s site here for more info about her products.